Robert Andrew Salons and Spas in Crofton, Maryland presented FACES: A Night of Pink Hope, on Saturday, October 8, 2011 at the Annapolis Hotel. 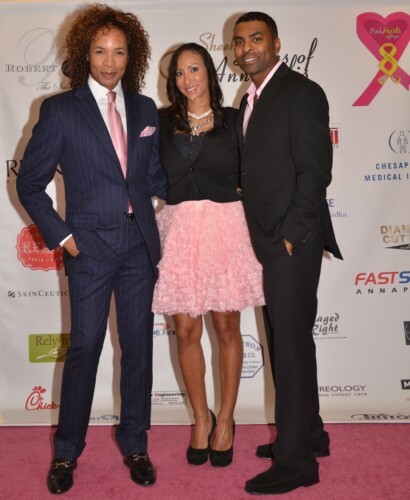 The event was filled with love, charity and goodwill, and featured Paul Wharton as the Master of Ceremonies. This exquisite runway hair and fashion show was sponsored by RA Cares, Sheehy Lexus of Annapolis, Chesapeake Medical Imaging, Christina Keane, Fastsigns of Annapolis, Capital One Bank, Relysh, CORT Furnishing, Sly Horse Studio, and Stage Right Productions, Franey Family Foundation, to name just a few. All of the proceeds resulting from A Night of Pink Hope went to benefit the We Believe Foundation’s Pink Hearts of Hope Fund which helps young women who are battling breast cancer. Robert Andrew Zupko, CEO of Robert Andrew Salons and Spas, and the President of Robert Andrew Salons and Spas, Melissa Eppinger, served as co-hosts for the event. More than 300 event attendees came out to support a worthy cause. Robert Andrew Salons and Spas made significant contribution in making “A Night of Pink Hope” a successful event. As a presenting sponsor, Robert Andrew Salons and Spas contributed more than $15, 000 for the use of swag bags, silent auction items and other expenses. From the moment the guests arrived, they immediately acknowledged that they would experience a wonderful evening. El’Jay DeShield of DeShield Enterprises, LLC served as the Public Relations Director for the event, and as the guests stepped onto the lovely pink carpet and posed for pictures they were dressed in their finest outfits and many women were wearing pink to outwardly support this wonderful cause. Those who obtained VIP tickets were announced to the media core, and treated to elegant hors d’oeuvres and delicious cocktails. There were many well-known faces in the crowd, including husband and wife music artists, Ginuwine and Solé. Sarah Miller, President of We Believe Foundation, and Terri Shaffer, Executive Director of Pink Hearts of Hope Fund, informed the audience about how their donations will help fund and help the two organizations. While speaking, there were cancer survivor models on platform around the room who were introduced and had their stories told. Jinahie, a spoken word artist, had the crowd enthralled and touched. Her heartfelt recitation produced the standing ovation of all standing ovations. She recited a poem revolving around a mother speaking with her daughter about the young girl’s cancer and had much of the audience either wiping away tears or trying desperately not to become emotional. After Jinahie had left the stage, they had to bring her back out to settle the crowd down and get them back in their seats. The fashion show closed with a performance from some of the Washington Redskins cheerleaders and the Baltimore Ravens cheerleaders each taking the stage to perform a short routine for the crowd. As guests left the room with their exquisite swag bags filled with beauty products, retailer vouchers and other useful items, their faces were filled with looks of appreciation for the individuals whom they were there to support and the need to do something more for such a worthy cause. A Night of Pink Hope was a success due to the hard work Robert Andrew’s Artistic Director, Brian Washburn; Runway Coordinator and Celebrity Stylist, Rose DiFerdinando; Technical Producer, Andrew Larris and Event Producer and Promoter, Eddie Fam. More than $125,000 in services and products were donated to create an event to raise awareness for young adults battling cancer. An additional $25,000 in monetary donations was raised.